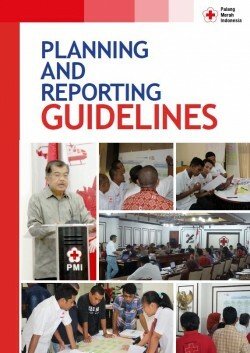 The guidelines were developed by PMI in order to build capacity, skill and practice in performing standard planning and reporting in PMI at all levels, to ensure that all efforts taken by PMI nationwide will contribute to strong PMI’s character, professionalism, self-sustenance and respect by the communities. The guidelines were developed based on inputs from various PMI personnel, from National Headquarters, Chapters and Branches. Introduction: describes the development process of Strategic Plan and Operational Plan, the purpose and benefits, as well as the scope of planning in PMI at all levels. PMI Planning Documents 2014-2019: consisting of Flowcharts of the Strategic Plan and Operational Plan, background and rationale, Strategic Plan and Operational Plan matrices, Indicator Registry and List of Activities to achieve outputs. Planning Mechanism: the principles of planning, planning process, planning or annual meeting schedule. Work Plan Development Process: consisting of planning formats for all levels along with filling instructions. Reporting: consisting of the purposes and benefits, reporting content and schedule, formats of monthly, quarterly, semester and annual report.